Create fast and realistic in-camera blurs and defocus along with host of tools for sharpening images with the Sapphire Blur and Sharpen Unit. RackDefocus - Simulate a real, defocused camera lens and preserve delicate highlights. Beauty - Apply smoothing, de-aging, color correction, soft focus, and glow to skin regions. 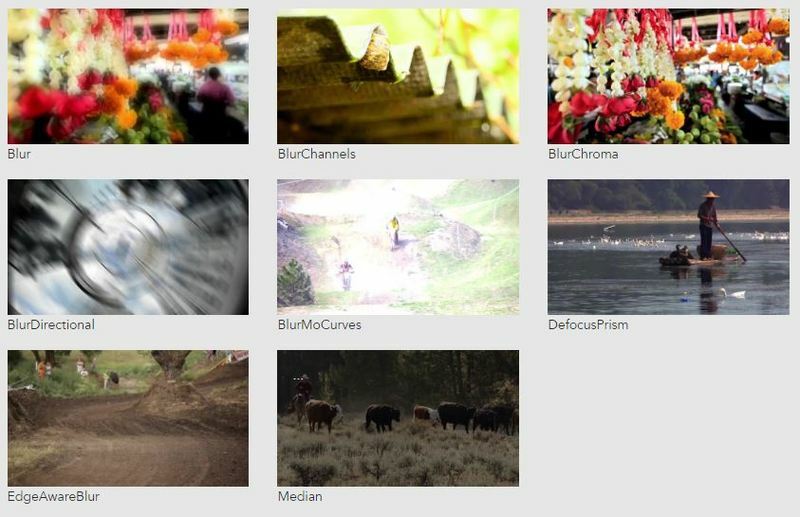 Blur - Produce a high-quality blur effect without sacrificing speed or interactivity. ZBlur - Blurs areas of the source clip by different amounts using depth values from a ZBuffer input. ZDefocus - Defocuses areas of the source clip by different amounts using depth values from a ZBuffer input. BlurMotion - Add realistic motion blur to any clip with full control over angle, size, direction, and complexity. EdgeAwareBlur - Blur the fine textures of an image while preserving crisp, defined edges. Deband - Smooth out a clip by removing banding artifacts and diffusing pixels across the banded areas. Sharpen - Amplify edges and fine details in your footage to create crisp and defined edges. GrainRemove - Smooths the source clip while retaining the edges. Convolve - Convolves a source image with a kernel. ZConvolve - Convolves areas of the source clip using a kernel which is made larger or smaller using depth values from a ZBuffer input.